The Moroccan medinas are the old cities where cars can’t enter. They are meant for able-bodied humans or horses, donkeys and mules, but not for people with physical disabilities. I took the bus from Chefchaouen to Fes and arrived at night on a rainy day. It was dark and the ground was wet. I didn’t see a step. I fell and suffered a terrible ankle sprain. Two taxi drivers at the CTM bus station in Fes rushed to help me get up. They asked me how they could help. I gave them the number of my riad (hotel), Riad Perle de la Medina. As I sat on a plastic chair at the bus station wincing in utter pain, the taxi drivers called the riad and explained that their new guest had just had an accident and may need medical care. Ayoub, the riad employee, told the taxi driver to drive me to one of the outside walls of the medina and Ayoub would pick me up and bring me to the riad. I couldn’t walk. I didn’t have crutches. I held on to the Ayoub’s arm as I hopped on the cobblestone. But it was too difficult. It was hard to hop on the wet cobblestones without falling. I spotted a man moving a wheelbarrow. Ayoub asked the man to wheel me (for a small fee) to the road. The wheelbarrow had rainwater inside. It was usually used to transport carpets. I arrived at the gorgeous riad and took off my boots and socks and was shocked to see how terribly swollen my ankle was. It looked like part of a tennis ball had grown on my ankle! Luckily, I easily found the Ibuprofen in my suitcase and took it with some traditional Moroccan mint tea. I was relieved when some of my pain went away but I knew the accident was serious and I would need to go to a hospital. It was a Sunday night and my best option was a private hospital. When I arrived at the private hospital, my pants were wet, smelly (from the dirty water) and dirty but I was not complaining. I was grateful for the wheelbarrow! A hospital worker brought me a wheelchair to transport me from the taxi to the emergency room. I started speaking to the emergency room doctor in French. Since I had fallen before in France, I knew all the French words for ankle, sprain, inflammation and crutches. The doctor took my passport to write down my name, birth date and passport number. He was surprised to see my birthplace listed as Russia in my passport and was curious why I spoke fluent French and had a US passport. He had done his medical school training in Russia and preferred to discuss my case in Russian! I got an X-ray and waited for the orthopedist to review it. The orthopedist, dressed in a baseball hat and track suit, told me in French that I had a very bad ankle sprain and couldn’t walk. He told me I needed to return to the US for further treatment. The swelling around my ankle was terrible. Ayoub told me about a Moroccan remedy to reduce swelling: egg and flour. Basically, I had Moroccan msemmen pancake mix on my foot overnight to reduce the inflammation. I don’t know if it worked, but it was the first time a pancake was on my foot rather than in my mouth! As stunning as the riad (hotel) in Fes was, I didn’t want to be stuck indoors watching CNN International and France 24 news all day. I came to Morocco to see Morocco not cable news! Two days after the fall, Ayoub lent me a wheelchair. He found me a tour guide and someone to wheel me around the medina. Even with two people holding the wheelchair, it was sometimes scary to go downhill. I never had to ask for help. Moroccans stopped whatever they were doing and helped move the wheelchair in tough spots. Moroccans in the medinas are used to transporting the elderly and infirm by carrying them. It’s about community. As a kid, you see your neighbors and family carrying your grandmother to the road to go to the hospital. So when you’re an able-bodied and strong, you naturally know you have to help carry someone when they can’t walk. Accessibility is based on who is around you and what they can do to help you and less so on what infrastructure (if any) exists. Even though there were some ramps for wheelchairs and strollers in the medina, they weren’t safe. Several people had to hold the wheelchair so I wouldn’t fall. These types of steps make it easier to go downhill in a wheelchair but it is a very bumpy ride, and sometimes scary. If people aren’t accustomed to relying solely on technology or infrastructure, giving them something like a narrow and steep ramp on a cobblestone street in the Moroccan medina isn’t enough. They still need human help. I flew home early because of my accident and unfortunately, I flew on my birthday. It was the worst birthday I have ever had. On my way home, my flight from Casablanca to Montreal was delayed by more than 10 hours. Everyone on the flight was put in a “day hotel” but there was only one wheelchair for two of us who needed it. There weren’t enough beds in the hotel for all of the stranded passengers. As I stood on crutches in the hotel cafeteria, wondering how I was going to put food on my tray, a Moroccan man, whom I didn’t know, said he’d put the food and drinks I needed on my tray. I didn’t ask. He just offered. 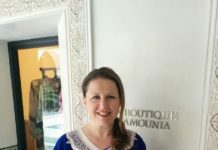 I was very grateful for how incredibly helpful Moroccans were to me. 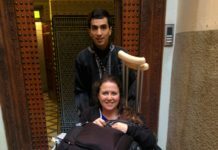 I have been on crutches and in a wheelchair many times in the US and I can’t say that people in the US are as helpful to people who are permanently or temporarily disabled as the Moroccans were to me. I think this has to do with Moroccan culture that is based on community support, compared to the individualistic one we have in the US. 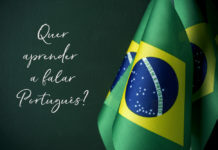 When the flight from Casablanca landed in Montreal, I had missed my connecting flight to San Francisco and had to spend the night in Montreal, again on my birthday! I was not prepared for the icy streets and snow. The hotel didn’t have a wheelchair and I asked the hotel employee to get me an office chair with four wheels. I pushed my crutches on the ground, like oars on a boat, to move the wheelchair. The office chair was still better than a wet wheelbarrow! Four and a half months after my Moroccan fall, my foot did not heal and I had to undergo two surgeries. I am still recovering from the operations and have limited mobility. There is no doubt in my mind that I’d like to return to Fes and see it in all its glory, but preferably on my two feet. Next articleI was a child refugee. Don’t send back the migrant ships!